Is your memory letting you down? 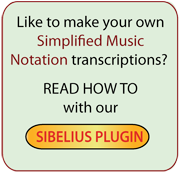 "I tried [Simplified Music Notation] out today at school with immediate success. A group of secondary pupils aged 14 who can read simple melodies in C were able to play comfortably in A major using your technique." "I feel this is an important development in music." "Although I do not have any trouble in sight-reading from traditional notation, I tried your method out on some music with which I was totally unfamiliar and found it made playing not only easier, but simple.."
"I was surprised how simple it was to adjust to your system: I was able to sight-read fluently within no more than a minute or two. This in itself indicates the enormously increased accessibility of printed music to those who would otherwise be discouraged by conventional notation.."
"The Simplified Music Notation which you have devised is straightforward and logical - the fact that it is based on the traditional system means that those who have studied [it] can approach traditional notation without abandoning what has already been learnt." 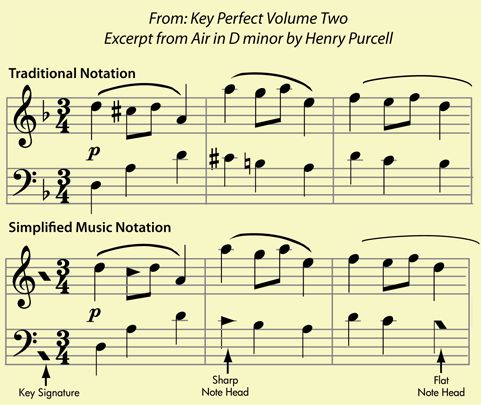 "Simplified Music Notation … reduces variability, thus enabling all musicians to simply focus on the music at its primary source. I believe your project provides an elegant solution for many musicians. I hope to see it applied to a more widespread audience."